There are many condominiums and vacation rentals available in the Myrtle Beach area, which is the central portion of the greater Grand Strand. 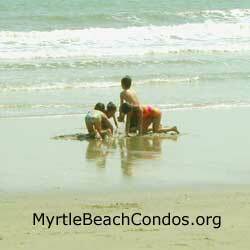 On this site are featured the condos and vacation rentals of the Grand Strand. Kingston Plantation Resort features luxury oceanfront Myrtle Beach condos located on the sandy white beach at 9800 Queensway Boulevard on the northern tip of Myrtle Beach. Previous and returning guests have written many reviews of these condos, the majority of which have been resoundingly positive. Choices of rentals range from one, two and three bedroom villas in the wooded and lakeview sections, to one bedroom oceanview condos. A few of the amenities that stand out include on-site babysitting service, a sparkling swimming pool for guests, on on-site restaurant, as well as a spa and meeting facilities. If you're flying into the Grand Strand, the Myrtle Beach Airport is located just 12 miles south of the Kingston Plantation resort property. If you're driving into town from Highway 501, take the exit for Highway 17 North and stay on 17 North for about 10 miles. At Lake Arrowhead Road turn right. go to the next light, turn left onto Kings Road. Kingston Plantation is about a quarter of a mile on the right. From Highway 9 - Follow signs to the coast. Highway 9 ends and turns into Highway 17 South. Continue on Highway 17 South for several miles and after the Colonial Mall (on your right) turn left onto Kings Road and follow for about one mile. Kingston Plantation will be on the left. From Highway. 501 via Hwy. 22 - Take Highway 22 east for approximately 28 miles, then take the Kings Road exit and turn right at the bottom of the ramp. Follow Kings Road for about one and a half miles to the Kingston Plantation, where the entrance will on your left. You'll find that Kingston Plantation's central Grand Strand location is ideal for its proximity to all major attractions and fun things to do. Restaurant row and highly visited Barefoot Landing are just a short drive from the property, and there are several top restaurants close by, including Chestnut Hill, Greg Normans Grill, Hard Rock Cafe, the House of Blues, Joe's Bar & Grill, Miyabi Japanese Steakhouse, Sea Captain's House, Thoroughbred's, and Umbertos Italian Restaurant. See current discount rates on this featured oceanfront resort and read reviews by other travelers who've stayed here. 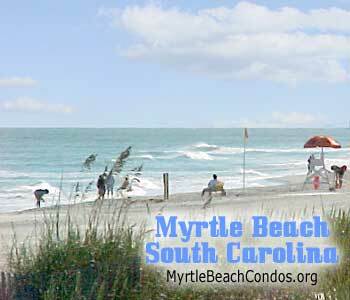 Myrtle Beach is an exceptional location for baby boomers to spend their vacations. The climate is mild and sub-tropical, with an average annual temperature of 64.1 degrees. Thanks to warm air currents from the Gulf Stream and the Atlantic Ocean, residents are treated to balmy weather all year long. Of course, the water temperature tends to be cooler in January (around 50 degrees) than in August (85 degrees). But even in winter, you can enjoy a pleasant walk along the beach. Generally speaking, the Grand Strand is a region made up of two counties -- Georgetown and Horry -- that stretches along more than 60 miles of coastline and extends 40 to 50 miles inland. Although people hopefully won't require medical attention when on vacation, Myrtle Beach boasts outstanding medical care available. Area hospitals include Conway, Georgetown Memorial, Grand Strand Regional Medical Center, and Loris Health Care System. For the more physically active, there are tennis and basketball courts, baseball fields, and golf courses. For a little less exertion, there are lovely state parks and tranquil marinas along the Intracoastal Waterway. As far as theater is concerned, you can choose from a number of entertainment venues, including the Alabama Theater and Celebrity Theatre in North Myrtle Beach, the Legends in Concert in Surfside Beach, and Swamp Fox Players in Georgetown. In Myrtle Beach itself, you can choose from among the Dixie Stampede, the Carolina Opry, the Palace Theater, and Medieval Times Dinner and Tournament. If your favorite pasttime is shopping, you'll adore Myrtle Beach, with its collection of malls, retail outlet stores, and specialty shops along the Grand Strand. And if you'd rather not drive, rest assured Myrtle Beach has plenty of buses and taxicabs available. From transportation to theater to recreation to medical care, Myrtle Beach offers the services baby boomers will love for a healthy, fun-filled vacation. Copyright ©1999-2008 - No reproduction permitted.